Two styles of Decal for different mounting applications. Size 7"W X 3"H, M.F. Blouin item numbers listed below. Insurance Amount - Your savings federall insured to at least $ 250,000 and backed by the full faith and credit of the United States Government. Custom colors available per request. Signs sold individually. available in two materials, Laminated Decals and Heavy-Duty Decals, Laminated Decals are printed vinyl with gloss laminated, Heavy-Duty Decals are Sub-Surface printed Lexan with 3M adhesive, recommended for ATM's, Drive-Ups, night depositories, teller lines, check desks, and customer service desks, indoor or outdoor use. Standard colors are blue with white copy and black with white copy. Specify color needed. Custom colors are available per request. Variety of Counter & Wall styles for different applications. M.F. Blouin item numbers listed below. Insurance Amount - Your savings federall insured to at least $ 250,000 and backed by the full faith and credit of the United States Government. Signs sold individually. 7"W X 3"H matte finish - surface screen printed copy, with high-bond adhesive tape on back. 7"W X 3"H matte finish - surface screen printed copy, sign slants back. 7"W X 3"H polished acrylic sign - Sub-Surface screen printed copy, with high-bond adhesive tape on back for wall mounting. 7"W X 3"H polished acrylic sign - Sub-Surface screen printed copy, sign slants back. 7"W X 3"H matte finish blue sign on a 7 1/2"W X 3 1/2"H back plate, screen printed copy, polished aluminum base, sign stands vertical. 7"W X 3"H Sub-Surface printed NCUA sign on non-glare Lexan, 1/4" thick matte T-Stand, sign and stand color match. Custom colors available per request. Blue laminate with white letters, sign size 7"W X 3"H, Counter Plexiglas Base size 7 1/2"W X 2"D, wall style with double-coated adhesive tape on back. 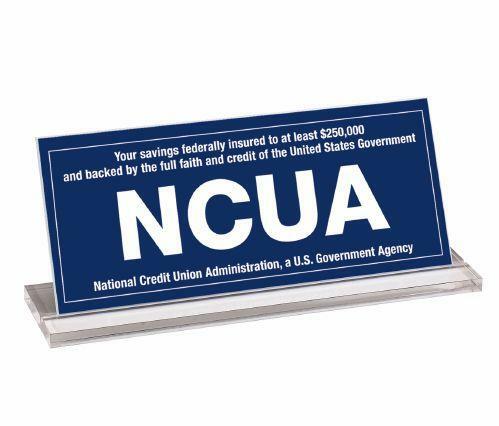 NCUA Combination 7"W X 6 1/2"H Countertop & Wall Acrylic Signs, NCUA logo combined with a Compliance Sign, available in Countertop or Wall styles, Sub-Surface printed on acrylic, Custom imprinted signs are available per request. for mounting. Signs sold individually. size 7"W X 6 1/2", Countertop Sign is slant-back style, Wall Sign is supplied with adhesive tape for mounting. Signs sold individually. Countertop & Wall Acrylic Signs, size 7"W X 6 1/2"H, Countertop Signs is slant-back style, Wall Sign is supplied with adhesive tape for Mounting. Custom Copy one-time Typeset charge is required for custom copy. NCUA Combination 7"W X 6 1/2"H Countertop & Wall Magnetic Signs, NCUA logo combined with a Compliance Sign, available in Countertop or Wall styles, Sub-Surface printed on Lexan Magnetic Strips, Separate NCUA & Compliance Strips - when NCUA logo or Compliance Signs change, replace either strip as needed. NCUA Strip 7"W X 3"H, Compliance Sign Strip 7"W X 3 1/2"H. Custom imprinted signs available per request. size 7"W X 6 1/2"H, Countertop Sign is slant-back style, Wall Sign is supplied with adhesive tape for mounting. Signs sold individually. 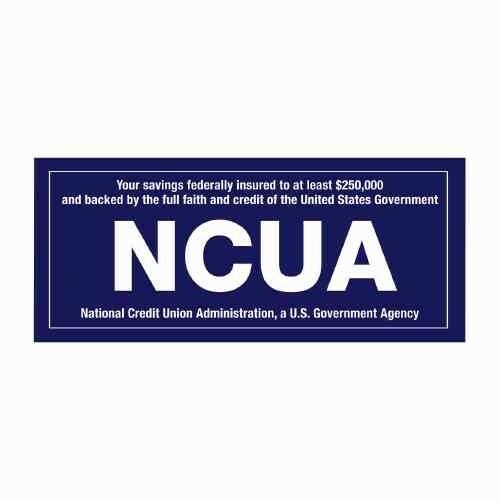 NCUA - Funds Availability (Custom Copy) Combination Countertop & Wall Magnetic Signs, size 7"W X 6 1/2"H, Countertop Sign is slant-back style, Wall Sign is supplied with adhesive tape for Mounting. Signs sold individually. Displays participation in the Shared Branch Network with the required "Shared Branch Network" Notice. Available in Wall or Countertop Sign styles or one-sided Decal style. Wall Sign is supplied with adhesive tape for Mounting. Countertop Sign is one piece acrylic, slant-back style. Sold individually. **Additional NCUA style signs including custom signs are available, for details use Contact Us tab on our website or contact Roger Zavodny directly by e-mail at roger@myvaultllc.com or by phone at 440-346-4593.